The two features I look out for the most while travelling to other cities are character and authenticity. Alright I guess that’s a pretty obvious thing to say, but still, that’s not always easy to find, especially when in a very touristy city. So you are in Rome, and as beautiful as the Spanish Steps may be, sitting with hordes of agitated, selfie-stick swinging tourists somehow does not sound appealing to you? Well, then let me propose my much adored “Piazza Testaccio”! 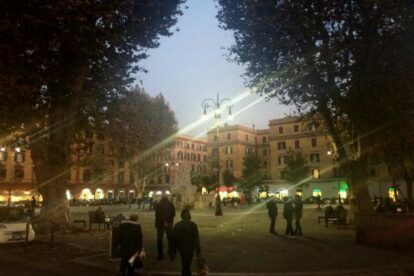 The Testaccio “square” is, as the name may give away, the heart of the Testaccio neighbourhood. The Testaccio on the other side is what most Romans would describe to you as the most “Roman” neighbourhood in Rome, and I’d strongly agree… and no, this does not mean it’s full of amphitheaters and gladiators, I’m talking about contemporary Rome. Just visualize the perfect stereotyped Italian piazza, et voilà. It’s all there; Children playing football in the streets, old men sitting on benches all day long doing whatever and mothers calling their husbands and kids in for dinner from their windows. In fact every time I come here I just sit down for some time and watch the comings and goings of people, simply enjoying the atmosphere. But also architecturally the square and the surrounding neighbourhood are stunningly beautiful, with most of its splendid structures built at the end of the 19th century. Honestly, to me this is one of the most aesthetically attractive places in all of Rome.